I found out about this event last night and wanted to spread the word about it. Plus, it happens to be a culmination of two figures I've written about previously. Double Oaks Community Pool, 1200 Newland Rd., Charlotte, 704-336-2653. 12-12:20 p.m.: Cullen participates in Q&A session with participants. 12:20-1 p.m.: Swim stroke clinic with participants. Park and Rec aquatics will assist. 1-1:30 p.m.: Fun relay races. 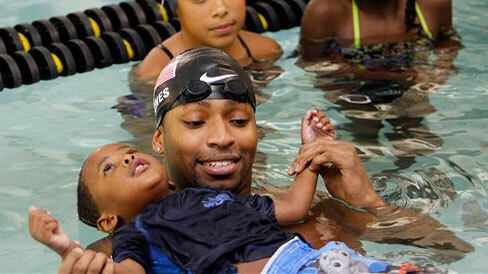 Cullen Jones leads a nationwide initiative to teach kids how to swim. Courtesy of newsone.com. Olympic Day is an annual, worldwide celebration held on June 23, to commemorate the birth of the modern Olympic Games. From June 17-26, 2011, communities across the United States will celebrate Olympic Day through educational programming and other activities, such as the event Double Oaks is holding on June 21. The celebration is an international effort to promote fitness and well-being in addition to Olympic ideals of fair play, perseverance, respect, and sportsmanship. I've written about Cullen for Charlotte magazine and kept you updated on him periodically here on Grown People Talking. And coincidentally, two and a half years ago I wrote about Double Oaks for the December 2008 issue of Charlotte magazine, in a story titled "The $25 Million Hood." At the time, Double Oaks was one of Charlotte's poorest neighborhoods and was in the process of being torn down and redeveloped by the Charlotte-Mecklenburg Housing Partnership. Over the past year, significant progress has been made, including two large housing units opening and dozens of families have moved in. One of the new developments in Double Oaks. Courtesy of charlottemechanical.com.